When I reviewed 1982’s Porky’s, I noted the lack of subsequent success achieved by most of that film's cast. Check out the roster of talent and you will see many names that were never heard from again. I compared its actors to those of other films that included future celebrities, but somehow I neglected to discuss the ultimate cast that went on to hit it big. Even beyond this "A"-list are a number of recognizable folks. We have Bruce Springsteen's sister Pamela plus already-established actors like Ray Walston and Vincent Schiavelli. Even Amanda Wyss went on to appear in another hit via 1984’s A Nightmare on Elm Street. The most notable duds - as far as future success went - were Robert Romanus and Brian Backer, but although their names are obscure, a glance through IMDB shows that they at least maintained serviceable careers. Penn's performance remains pretty remarkable. Yeah, it seems like it should be easy to play a stoner like Spicoli, as we've seen it done a thousand times since 1982. However, the level of perfection he achieves is astonishing. At the risk of sounding overblown, he becomes Spicoli. I mean, I knew guys like that in high school, and Penn nails it. Actually, the acting in Fast Times is excellent across the board. Each participant successfully conveys what he or she needs to do in his or her part. Probably the best of the rest of the bunch is Leigh, who displays a wide range of emotions as Stacy, the character who goes through the most during the film. She makes Stacy the epitome of a girl stuck somewhere between being a child and an adult, unlike most of the overly mature "teenagers" we usually see in this sort of movie. Fast Times at Ridgemont High appears in an aspect ratio of approximately 1.85:1 on this Blu-ray Disc. Low-budget 32-year-old movies come with inconsistent visuals, and that was the case here. Sharpness generally appeared positive. Some softness interfered at times, though, and a smattering of shots came across as a bit ill-defined. Still, most of the flick presented good delineation. No issues with jagged edges or shimmering occurred, but I noticed some light edge haloes at times. While grainy, I didn’t think the image suffered from a ton of source defects. I noticed occasional specks and blemishes but nothing heavy. On the other hand, the movie presented surprisingly solid colors. The film’s palette tended toward a natural depiction of hues, and they always looked nicely bright and lively. Blacks were deep and dense, while most shadows seemed adequately clear. A few darker shots looked a bit too thick, but those were in the minority. Nothing here dazzled, but the image seemed mostly satisfactory. Instead of the movie’s original monaural audio, this release included a DTS 5.1 remix. For the most part, it focused on the front center and didn’t do much to spread out from there. With one exception, music demonstrated broad mono and didn’t show distinctive stereo imaging. The only example of true stereo came from the Cars’ “Moving in Stereo” during Brad’s fantasy. Effects showed general ambience with a little movement and panning, but they didn’t do much. The surrounds followed suit and failed to add much to the package. They reinforced the front in a bland manner and that was it. Audio quality was mediocre. Speech consistently remained intelligible and without edginess, but the lines sounded flat and thin. Effects usually came across the same way; except for the waves in Spicoli’s dream, they lacked life or definition. Music varied depending on the source, but the songs usually were moderately vivid at best. Though some worked better than others, they usually appeared somewhat thin. Nothing terrible marred the presentation, but nothing exciting happened either, so I gave the track a “C”. How did the picture and audio of the Blu-ray compare to those of the 2004 DVD? Audio was similar, as the source remained so low-key that the Blu-ray’s lossless presentation didn’t add much. Restrictions related to the original film also held back the image, but I thought the Blu-ray looked more concise and cleaner than the DVD. This didn’t become a revelation, but it offered improvements. The Blu-ray mixes old and new extras. First up is a pretty good audio commentary from writer Cameron Crowe and director Amy Heckerling, both of whom sit together for this running, screen-specific piece. They cover a mix of subjects but mostly focus on the cast. They tell us about how many of the actors came to the film as well as working with them and various improvisations. We get notes about the movie’s tone and battles with the studio who wanted it to be sillier, and we also hear about the music and other production notes. Plenty of cool tidbits emerge, such as the fact the producers tried to hire David Lynch to direct! The track becomes a little too giggly at times, but it includes a lot of solid information and proves to be a winning commentary. 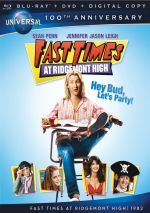 In addition to the film’s trailer, we get a 39-minute and 15-second documentary called Reliving Our Fast Times At Ridgemont High. We get remarks from Heckerling, producer Art Linson, casting director Don Phillips, and actors Judge Reinhold, Scott Thomson, Sean Penn, Eric Stoltz, Robert Romanus, Ray Walston and Brian Backer. They chat about the roots of the story, bringing it to the screen, casting, general anecdotes, its release and reception. The comments about the cast heavily dominate, as the vast majority of the show focuses on that subject. Nothing here stands out; it's very typical of the genre. The biggest surprise comes from the participation of Penn, who I didn’t expect to see. It's ultimately a good piece but it seems vaguely lackluster. I liked it, but not tremendously so. Note that some of Heckerling's anecdotes from the commentary are repeated here. New to the Blu-ray, U-Control provides two options. “Music of Fast Times at Ridgemont High” simply credits the movie’s songs as they play. It’s a helpful primer but not anything memorable. As for “Scene Companion”, it offers a running picture-in-picture piece. Along the way, we hear from Heckerling, Reinhold, Romanus, Linson, Thomson, and Backer. The “Companion” looks at the source material and its adaptation, sets and locations, cast and performances, and the participants’ own high school memories. The “Companion” crops up a little too infrequently but it adds some useful material along the way.